Today's card was inspired by Michelle Lupton, this week's Muse over on the Muse challenge. I was inspired by the "leaf" shape and colors Michelle used on her card. So pretty, Kristy. Love your colour combo. I love the leaf pattern. This is pretty. I had to go look at Michelle's card, too. Another pretty one. Oh I love this leaf pattern that you created!! It looks so cool!! very pretty Kristie. Love the combo of the colours. You KNOW that I'm totally loving this card! Clean. Simple. Graphic. PERFECTLY STAMPED. Awesome job Kristie! Very pretty. Love the pattern. Loving your graphic style of this card. This is a very pretty interpretation of Michelle's card and well worth CASEing on its own. 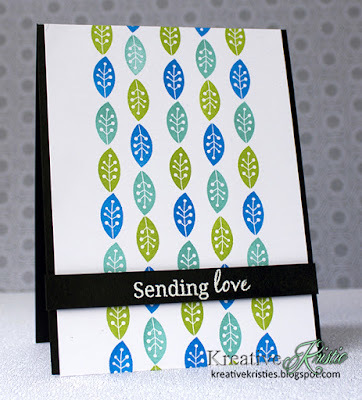 What a gorgeous card and a very effective effect for these beautiful leaves ! Love your very CAS interpretation of the card ! Thanks for sharing and for inspiring. Beautiful take on Michelle's card, Kristie! Oooo, so pretty, Kristie. Beautifully stamped.